A funfetti recipe that is light, fluffy, full of flavor and easy to make! This is my go-to cake recipe for birthdays and special occasions! Combine your wet ingredients milk and oil and set aside. Add in egg whites one at a time (roughly) and let fully combine after each addition before adding the next. Add in 1/3 of your dry ingredients and let combine. Add in 1/2 of your liquids, then dry, then liquids and the rest of your dry. Let mix until just combined. Fold in your sprinkles. Don't over mix. Add batter into prepared cake pans. sprinkle more sprinkles on top of the cake batter if desired. bake at 325 degrees F for 25-35 minutes or until a toothpick comes out clean when poked in the center. Let cool ten minutes then turn out cakes onto a cooling rack. Wrap warm and place into the freezer to flash chill. This locks in the moisture. Once cool but not frozen you can then trim off the brown edges of your cakes and frost as desired. Melt chocolate in microwave or in a glass bowl over a pot of simmering water (bane marie) and add in water. Whisk until combined. Add food coloring if desired. Let cool to 90 degrees (Should feel slightly cool to the touch but still liquid) and drip over your frosted and chilled cake. Optional: switch to paddle attachment and let mix on low for 15 minutes to get all the air bubbles out. Frost cake as desired. 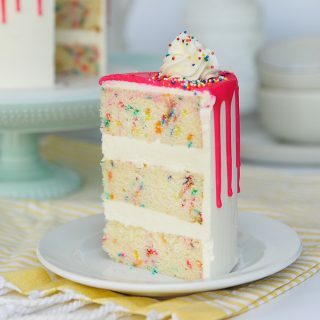 Learn to make this tasty funfetti birthday cake with easy buttercream and water ganache drip!